The Fingal 50 feature race has been won by Peter Dadson. Set off with Tony Savage, these two shared the work the whole race, buried themselves towards the finish and deservedly stayed away. Behind, a large A/B/C grade group formed just after the turn. Driven by Andrew Margison, this freight train couldn’t quite get to the front markers. 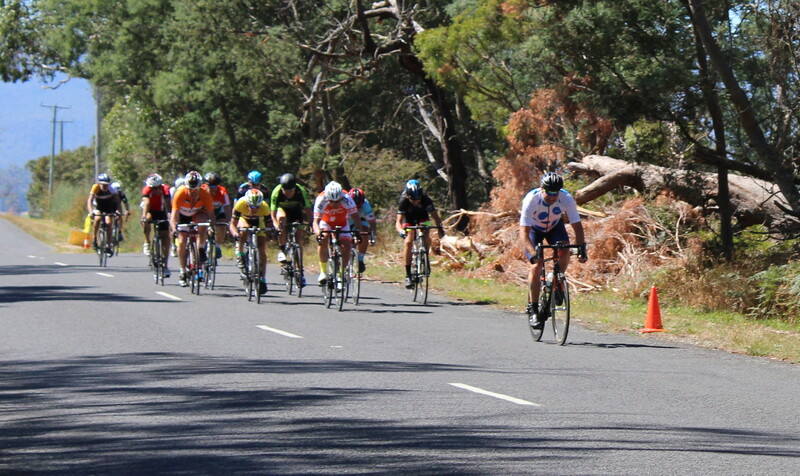 The D grade group of Tim Burford, John Frankling, Brooke Lendvay and Dean Mason also rode superbly to stay ahead of the chasing pack. Thanks goes to Sam Pratt for sponsoring the race (good to see him back racing), to Gary Woodfall and Mark Wilkie for help on the line and the ladies on the desk. Also thanks to colin Collin Burns for his support and organisation. Recently on our Facebook page the issue of ‘Handicapping’ was raised and how decisions around this are made. Handicapping refers to the gaps between groups that are racing in the same race with a view to all groups coming together towards the end, therefore giving everyone a chance of winning. The members of the handicap committee (with Paul Morgan as the Chief Handicapper) calculate the gaps between the grades depending on the riders present in the group. The Handicap committee also meet before feature races to allot groups and calculate gaps. The committee believes that this has been working well with most handicap races resulting in close finishes. This is not an exact science however and those doing the times do the best they can – there will be occasions when a group will not work well or another group will work exceptionally well skewing the result but overall, for the last three years, the results have been within what we would expect. This is evidenced by the spread of winnings across grades. We have years of worth of average speeds etc so there is some logic behind it. We also discuss different ways to approach the allocation of grades, for instance reviewing Strava or identifying members within a grade that may move up or down depending on the size of groups on a given race day, but they have proved problematic for one reason or another. I know that there are people that feel that someone else is the wrong grade (or even that they themselves are in the wrong grade) but unless we get something formal we are not going to operate on rumour. The committee is also not going to make a decision because a particular member feels it is a good idea as they may not be aware of consequences of moving riders. Often these conversations are around putting someone up a grade but to do this we need to be conscious of how taking riders out of a group is going to affect that group ie moving me from C grade to B grade will take 1/5 of the riders that has been turning up to C grade over the past 5 weeks – and yes I am probably ready to go up but, as best as we can, we need to look at the connotations. 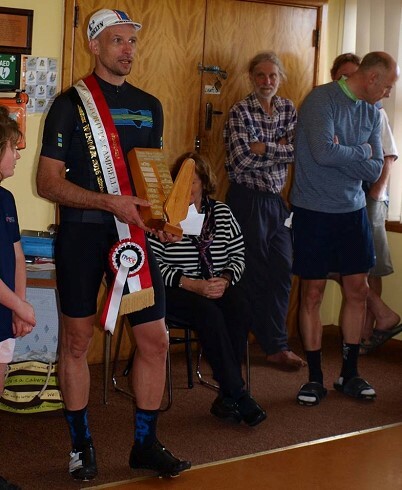 When I put my name forward to be president of the club, and I have articulated this as often as I could, I wanted to build on a culture of friendship while still recognising it is a ‘racing club.’ Most riders I speak with almost see winning as secondary to having an exciting race where you have competed in a safe atmosphere with your ‘mates’. Finally and most importantly this club is made up of a lot of great people but is run by a relatively small number of volunteers who give their time to provide the racing opportunities you enjoy. We only have conversations around how to improve the racing and keep the club going and we do the best we can. We are open to suggestions but that does not mean we will adopt every suggestion as there may well be reasons to take a different path and as elected representatives we must look at the club as a whole. We have also decided to formalise what was already happening – there will be a standard agenda item at our regular meetings to discuss rider movement. If you do have considered suggestions we are happy to hear from you. Arrange a time to discuss it with us or put it in a letter to the club. Click to download final KOM/QOM points. The Northern Vets have decided to hold the 2017 King/Queen of the mountain series over three weeks (four GMS races) this winter i.e. Bishopsbourne 23rd July, Selbourne Hall 30th July, Beauty Point 6th August with the final race the hilltop finish at Rosevale 13th August. The rules will be slightly different this year with a competition within each grade (A-G) with a simultaneous overall competition. There will be a number of intermediate KOMs as per the table below. For each of these, the winner will receive 5 competition points and second place 3 points. As before, these will be honesty placings, as we are unlikely to have a judges in situ. Place-getters will be required to report to the desk at the end of the race. There will be two hilltop finishes i.e. Selbourne Hall and Rosevale. Again, first and second over the line will receive KOM competition points. The number of points on these hilltop finishes will reflect the number of riders in your grade that day. Second place will receive three points less than the winner. So, for example, if D grade start with 7 riders, the winner will get 7 KOM points and second place will get 4. If C grade start with 12 riders, first place will get 12 points and second place 9. These extra points give greater kudos to the hilltop finishes and reward victories against larger numbers of riders in the overall competition. So encourage your fellow riders to turn up to these races to get more points! Strava kudos overrated?? Want some REAL kudos?? 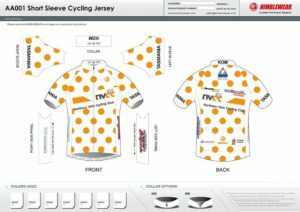 The points winner from EACH GRADE will win one of the limited edition jerseys below and will be able to wear this at NVCC races until the next KOM competion in 2018. So get yourself out there! If you are scheduled to be on duty and therefore unable to race, you will automatically be allocated 3 KOM competition points when you turn up for duty. If one race is cancelled due to inclement weather, the results will be based on the remaining three races. If two or more races are cancelled, the points will be frozen after Rosevale and the competition completed later in the year. The rider within each grade with the highest points will receive a cash prize. The club rider with highest points overall will win the club KOM trophy and additional cash prize. Second and third overall will also receive and additional cash prize. If a rider moves grades during the competition, his/her points will apply to the grade in which he/she started for the purposes of the KOM competition. In the event of a points tie, relevant prizes/trophies will be shared. Here is the roster for the next few weeks – I have posted it as there is some great racing coming up. You will see that we are not racing on the 26 March in support of the Western Tiers Challenge and I encourage everyone to go for a ride that day and support the charity. Our first Symonds Crit is then on the 2nd April and the race at Bishopsbourne will be sponsored by Team Daltini. A little break for easter and the second Feature Race of the year, Quamby Classic. The Criterium at Symonds Plains is sponsored by Cormiston Legal and we are grateful for Sam Pratt’s continued support of this great day. Click on the link below to see the flyer for the day. Also the Aromas van will be on site – so bring your hard earned money – or bring your race legs and win some. Don’t forget we open the Crits up to non-club members Masters 2 and older as long as they have a race licence – so is a great opportunity to come along and experience racing with this great club. I would like to thank Lynne Woodfall and Darren Cook for their commitment to the club, your work on the committee and your support for me. I am pleased to say that Lynne will continue working on the desk on race day. James Proverbs has agreed to take over the production of the race rosters and so you can direct your enquiries that way but I ask that you be patient as he learns the role. 2016 saw excellent numbers throughout the year and 2017 seems to be continuing the trend with excellent numbers at the normal races and a superb field at Fingal. The Northern Vets Fingal 50 classic was run in near perfect conditions as part of the annual Fingal Festival, with just on 57 starters. The flat, fast course saw the scratch bunch average 43kph. However, it was a day for the mid markers, the C and D groups combining at 35 km. Strong work from Dale Hainsworth and the two Kerry’s; Newman and Leonard helped keep this group away. Alex Robinson went early and strongly in the sprint, holding off Ty Farrow and Phil Stevenson for a great win. 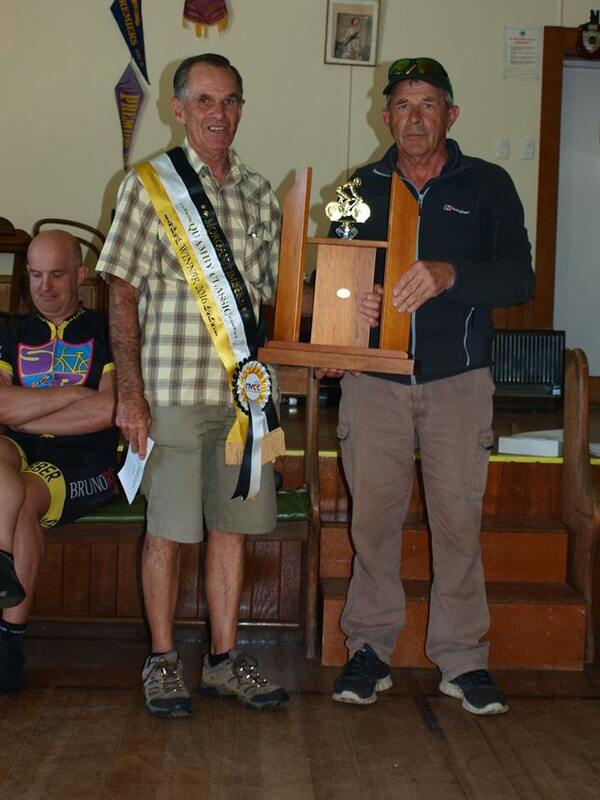 On 25th September the Northern Vets held their most prestigious feature race of the year, the 62km Somercotes Longford to Campbelltown handicap. This was an occasion for the seven strong scratch bunch to show their class. They worked equally and efficiently to make light of the cross winds and catch the front markers with 18km to go. At this point about 30 riders had massed at the front. 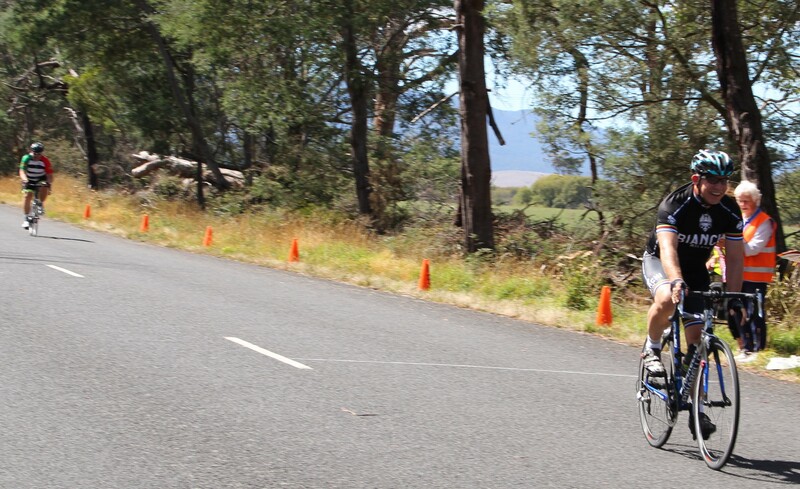 Ben Mather launched a searing solo attack on the climb about 10km from the finish. Only the strongest could mount any sort of a chase. It took a mighty effort from a group of about six riders to reel in Mather with 2km to go. The leaders must have been exhausted by this point and it was Scott Smith who showed why he is the club number one rider, taking out the win for his third feature race victory of the year. Dave Bingley was second and Richard Carroll third. The club also ran the 40km Campbell Town dash for the lower grades. Club favourite, Bob Mason had a great ride to take out the victory.